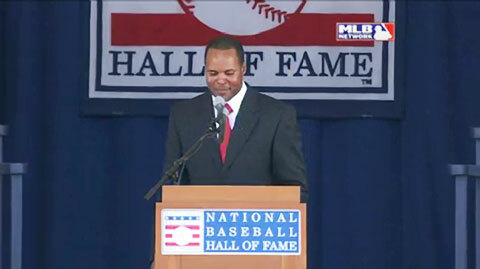 COOPERSTOWN, N.Y. — Former Cincinnati Reds shortstop, Barry Larkin, was inducted into the National Baseball Hall of Fame in a ceremony on Sunday, July 22, in Cooperstown, N.Y.
Barry Larkin, a popular speaker at PFP Sports and Celebrity Talent Agency, was inducted into Baseball Hall of Fame in Cooperstown, N.Y. on Sunday, July 22, 2012. Larkin, currently a baseball analyst for ESPN, singled out former teammates Pete Rose, Buddy Bell, Eric Davis, Dave Parker and Dave Concepcion. “My inclusion in the Hall of Fame is the ultimate validation. I want to thank you all for helping me along the way,” Larkin said. Larkin, who is considered one of the best shortstops in major league history, spent his entire speech thanking the people that molded him. Larkin, who played his entire 19-year career with the Reds, retired after the 2004 season with a .295 career average, 2,340 hits, 1,329 runs scored and 379 stolen bases.